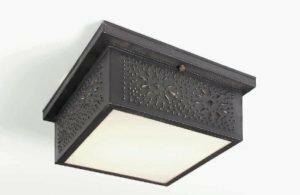 Lighting By Hammerworks handcrafted Rustic Pierced Tin Ceiling Lights CL116 are a charming addition to any room.. First of all these attractive round pieced tin ceiling fixtures combine quality craftsmanship with practical function. In addition because they are compact in size you can install them in areas with low ceilings. Furthermore you can mix and match with Punched Tin Ceiling Lights CL117. Thus this versatility offers an ideal option any place in the home from kitchens and bathrooms to hallways and family rooms. Of course just as with our Colonial Pierced Tin Chandeliers we make CL 116 Pierced Tin Ceiling Lights completely by hand with attention to detail. Most importantly we hand punch each fixture one at a time. Furthermore the charming reflection of the punched design on the ceiling when lit is delightful! Also we offer a variety of style and Finish Options. These include Antique Tin, Copper and Brass, as well as our custom Verdigris Copper or Painted Black. In terms of illumination we equip the round style CL116 with one medium base socket, UL rated for a maximum of 60 watts. All of the other Antique Tin Ceiling Lights have 2 sockets. In addition to the round CL116 we offer other Tin Ceiling Light With Seedy Glass models. Additionally you can choose from our collection of Antique Tin Punched Light Shades and Colonial Punched Tin Witch’s Hat chandeliers. Antique Tin Pierced Pendant Light Shade SH102 is a great choice for a country kitchen or dining area. Our unique Punched Tin Cone Shade SH103 is an ideal option as task lighting over a kitchen counter or island. 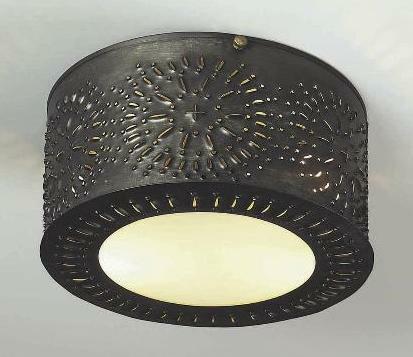 Furthermore Pierced Pendant Shades are available in antique tin or antique brass finish. 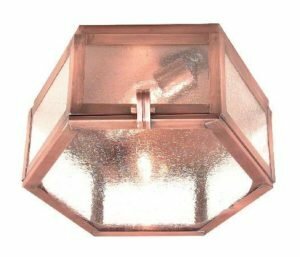 All hand punched pendant shades are UL rated for a 75 or 100 watt medium base bulb.